On last year’s Fucklord Dragonfist, Gnomefoam presented an eclectic mix of sampled music whose entertainment value lay more in its experimental plunderphonics nature than in actual songwriting. 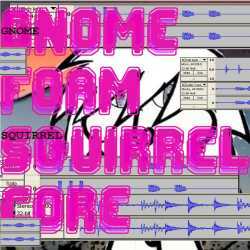 I didn’t expect anything different on Squirrelcore and was proven wrong, in a good way. His new collection promises to be more upbeat, but that’s certainly not the only thing that has changed. Already the opener Repeat (Girls With Bangs) shows a transformed artist who decided to write real songs, and great ones at that. The basic underlying principle is very independent sounding hip hop, complete with vocals, reminding of a more underground acting Why?. Although the tracks are quite short (only the last three ones make it over four minutes), they rarely rely on mere experimentalism. Take for instance the two and a half minute long Fell In Love With A Ladybug which has everything a future lo-fi indie classic should have: an unforgettable melody and a quirkiness that can only be described as utterly cute. Another highlight is Elf Time: The Legend Of Llanowar which surprises with a tremendous melody and proves that Stephen Bromley, the brain behind Gnomefoam, is quite an able vocalist. And to quote the intro of the song: “Any day you’re having fun with music is a good day” says already enough about the nature of Squirrelcore. Released on the net label Rack And Ruin, Squirrelcore is a free download album, so there is no reason to bypass this excellent surprise. In the impenetrable jungle of free album available nowadays, this one definitely stands out as a truly great one. There is still plenty of experimentation present, but it’s been splendidly integrated in the engaging songwriting, providing us with a best-of-both-worlds mentality that should allow Gnomefoam to reach an ever widening audience.